I apologize for the sudden hiatus in posting. This little family traveled to the swiss alps and things got a little hectic as the trip was approaching. We, once again, did a house swap with a swiss family. I can not recommend this way of traveling enough. We are staying in a *beautiful* 2 bedroom apartment in St.Gallen (north east of Switzerland) with a beautiful view over the old town and the alps. And our hosts even left us the key to their car! I was chuckling when we entered our temporary new home for the first time as there was a sign above the main entrance that said ‘built in 1907’. Our place in Brooklyn was built in 2007. A whopping 100 years difference. Ha! – Ella used her new Trunki for the first time and it was a big hit. She ran around with it on the airport and made quite a few heads turn. – One thing that makes G and me laugh every time we travel to Switzerland is the fact they never (!) even open his passport upon arrival in Zurich. They would not open it. Just wouldn’t. They always wave us through. Not quite the experience one has when traveling to the USA, for sure. – I can’t get over how amazing tap water tastes here. Both G and I go into raving mode every time we fill our glasses and start drinking. One could think we are talking about a really expensive bottle of red vino. – Switzerland is the land of indoor pools, it seems. G and I are always looking forward to our ‘swimming adventures’ especially now, with Ella getting into it. I am wondering, why swimming is not more part of american (youth) past time? And I don’t mean straight up swimming, I mean just going to pools and hang out, have fun, go on slides, play on the big inflatable toys they put out. It’s such a huge part of swiss culture. Growing up, I’d at least go to a pool once a week. – When at a supermarket, you need to weigh your veggies and fruit yourself. (each item has a corresponding number that you need to hit when putting your selected items on the appropriate scale in the veggie/fruit department.) I forget this *every* single time and earn angry, impatient looks upon check-out. Oopsie! 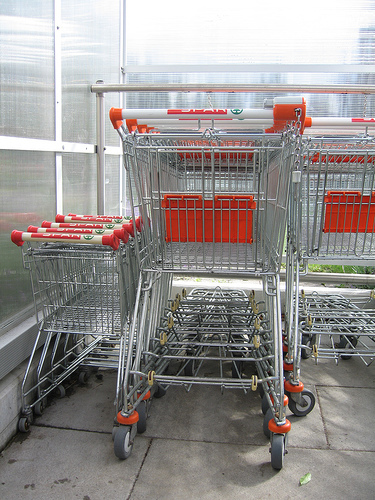 – I love that they have tiny shopping carts at most swiss supermarkets. Ella’s smile, when pushing one of these around, is priceless. – Jet lag going *to* Europe with a little one is not the problem, it’s coming back to the US. For some reason, Ella adjusts to swiss time right away, every time we make it to Switzerland. Going back is a different story. 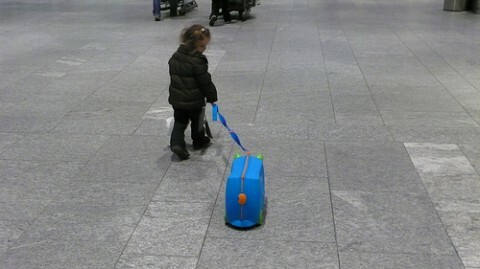 – Oh, and: Traveling with a toddler *can* be fun! I’ve been to Europe three times now and my favorite place was Switzerland. It’s just so beautiful there, and the air seems so fresh! Hope you have a wonderful holiday! It’s a pleasure to read everytime you post something about your travels back in switzerland :) What is funny too is how you notice some small details I take as granted and didn’t even notice them, being naturally part of my daily life. I agree with Daoro – your posts about Switzerland are an absolute joy! i must go there just for that water slide! so jealous, but i can vouch as a southern californian born and raised, pools, swimming and the beach were an integral part of my childhood. june birthday parties were at the beach and poolside, high school hot tub parties in the winter time, maybe it’s an east coast/west coast thing. i have met numbers of adults from the northeast who don’t know how to swim, really. The pools look like so much fun! have a nice stay well seems like you already do.. anyway..
they used to have mini carts in US groceries. we have to weigh our own fruit around where i live. agreed, more indoor pools in the US! those look SO FUN! I too always forget to weigh my produce first and have also experienced nasty looks from clerks! I feel so stupid…it’s not like I meant to forget but habits die hard, no? Don’t do this to me when I don’t go home over Christmas this year. :-( Makes me want to move back to Switzerland for good. Maybe we will. easy, the container labeled Hanf contains just that… I assume. Hanf is food too. i grew up in northeast ohio, and i don’t remember a day in the summer that we DIDN’T go swimming. i think the availability of pools in the suburbs definitely helped that. i can definitely testify that it was an integral part of my childhood. Can you list what website(s) you use for searching for house swaps? I am new to the idea but it sounds exciting! It’s definately a southern thing. I grew up in Texas, and I lived in the pools and the beach and lakes. Everyone knows how to swim here. It’s the heat….where it’s hot, people will swim. You are making me drool. I miss Switzerland so much it could make me cry. Oh how I wish I was back in Leysin!!! Enjoy yourself, and take lots of pictures. have a nice stay here in st.gallen! Do you know the “Alpamare” (“biggest covered waterpark in europe”) at Lake Zurich? I was there a few years ago and it was really cool. gruss an die tante und viel spass “daheim”. those indoor pools remind me a bit of noguchi’s playground designs! Have a marvelous time in St. Gallen! We lived there for a year and miss it. Your recommendation to swap houses is a great one. 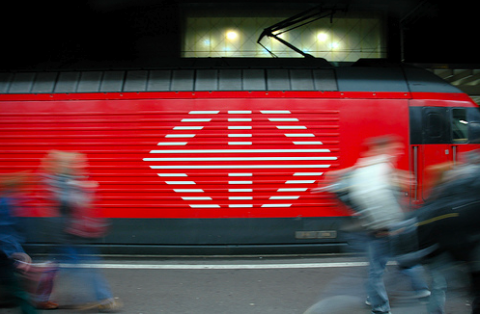 One odd request — my husband misses the “song” when a train is announced at the Bahnhof. I don’t know how to describe it, but if you have a way to record that 3-4 seconds of the sound, I would love to give it to him for Christmas. Maybe on a cell phone? Pure nostalgia…it evokes lots of memories for us. also, my first time in switzerland was on our honeymoon in ’85. i was flabbergasted because it was election day and a woman told us the hotel front desk would be shut down for a while and how excited she was to vote. i didn’t get it, “what’s the big deal?” i asked and was told swiss woman’s sufferage didn’t end until 1971! These are some great images. I love the water slide photo. That would be a great place to visit one day. Thanks for sharing these. Despite all the lakes, every neighborhood in Madison, Wisconsin has its own swimming pool. Friday evenings are for diving meets, swim teams compete on Saturday mornings, and there’s a big water ballet show every august. Kids from Madison high schools win swimming scholarships to ivy league schools all the time because they grow up at the pool. Who knew, right?! hi just called in from My French Window. They are the sort of things I miss about Italy..only go once a year, and by the third visit to the supermarket, I have the hang of it..we don’t have to weigh our fruit and veg in the UK either..love the little trollies. I definitely recognize this place from your description, right down to every little detail – even though I’m in French-speaking Switzerland. Enjoy your stay – St. Gall is a lovely place. It all looks so beautiful. On my visits to Switzerland their cleanliness and efficiency always blow me away. Have a very beautiful Christmas. Oh growing up in Ohio going to the pool was very integral. We would go every week during the open season, sometimes several times (2-4 times in a week). I couldn’t imagine my childhood without that. But I notice that in more urban areas swimming is much less than rural or suburban areas. So us small town folk like to swim HA HA. Ella looks soooo cute with the trunk!!! 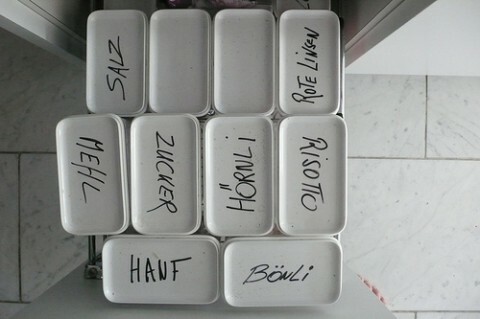 This post makes me miss my days in St. Gallen! I suppose it’s a big question, take your time, but I would really like to hear your thoughts. My parents live just 50 km north of the swiss border. Any other time I visit them I try take the time to go there to shop in the nearest Migros supermarket – that’s 60 minutes of “instant mini vacation to go”. Enjoy the CH fresh air! I’m homesick like Sabine.. What a beautiful post and it is all so true! swimming pools are a HUGE part of north american culture. i think the difference is that we don’t necessarily have architecturally-fascinating-horizontal-waterslides inside, all the time. i think it’s also important for this site as it shows the level of potential harm in contemporary graphic design. happy holidays swissmiss mom + family! sounds like a fun place to visit. thanks for sharing!